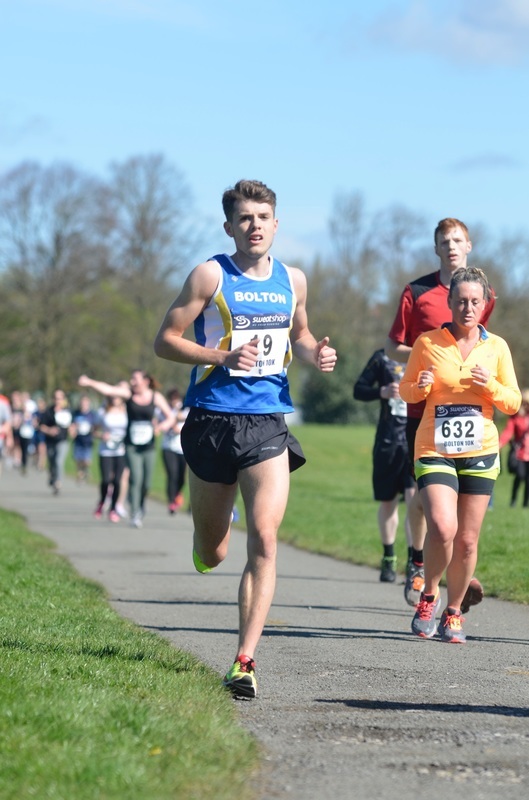 The Bolton 10K’s 683 finishers saw the hosts Bolton United Harriers occupy all three male podium positions and a course record survive by the slenderest of margins. Cold and clear skies at “daft o’clock” greeted the earliest of early birds setting up the 2-lap course around and within Leverhulme Park. Contrary to weather forecasts, it soon warmed up after sunrise as club helpers (and participants) arrived, with Registration opening up at 8am. As the One Mile Fun Runners dashed off, the marshal briefing got underway without the need for the gazebo. Indeed, shades were the order of the day, not just for the sun, but to protect the eyes from the lit candles upon Stuart Parsonson’s birthday cake! Bolton’s Jonny Kay opened an early gap on the rise up Spooky Hill and, comfortable with the quick pace, decided to take the race on his own terms. His lead was never threatened and victory was claimed in 33:20 – superb considering the hot conditions. Racing for the first time in 6 months, Tony Valentine netted silver nearly a minute later; it followed a ding-dong battle with teammate Karl Darcy where a barely 5 metres gap remained from start to finish, though both sprinted to the line in a fashion that Linford Christie would be proud of! 17-years-old Declan Toomey and Tommy Harrison made it five Blue Vests in the top 7, with Benoit Yerle, returning from France, joining Danny Shaw (U20) and Craig Renshaw to take the top two team prizes, well ahead of third-placed Darwen Dashers. 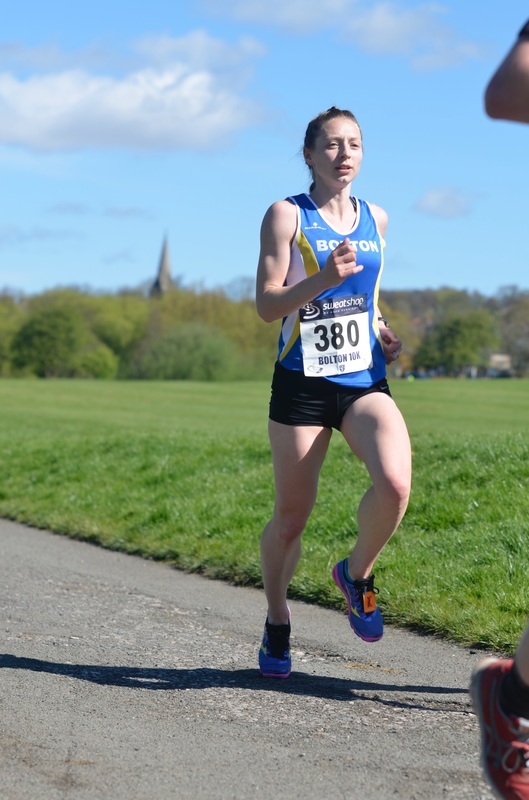 In the women’s race, Leeds City’s Katie Parry clearly blasted out with determination to beat the course record of 38:08 set last year. She triumphed by over a minute from Trafford AC’s Sarah Hadak, but was thwarted in her attempt by a mere two seconds, so BUH&AC’s Catherine O’Dwyer’s standard remains. Bury AC’s junior star Sophie Whittaker edged Bolton’s leading light Nicola Cartridge for bronze. Junior Amy Howatson joined F45 Lesley Heyes in the winning team ahead of Burnden RR, whilst Olivia Kearney led Georgia Greenhalgh and Zoe Gibson for an all U20 B team bronze. For Bolton, that 43 runners completed was incredible given the commitment to put on the race – over 40 otherwise regular runners assisted. Some achieved PBs whilst others beat their own course records. Notable mentions go to Eric Ranicar, whose 42:54 took the M65+ victory, Cecilia Woods as second F55+, and Marc Tillotson, who was not in his usual place on the results sheets after he ran with his charges from Bolton School in their fundraising efforts. University of Bolton SSIC students raised over £100 for Cancer Research UK, as some of the racing lecturers got firsthand experience of their students’ progress following their own 10K jogs. They weren’t the only ones – many runners enjoyed (if that is the right term?!) a post-race sports massage. Local residents were appreciative too, as they watched the spectacle and even donated some refreshments to a couple of lucky marshals. 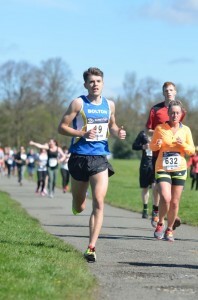 Full results, photos and links are available via the Bolton 10K website at www.bolton10k.org. The One Mile Fun Run held at 9am before the 10K saw 120 entrants range in age from 1 year old to 63 years young! Junior Blue Vests formed over a quarter of the field, with some great performances to match the attendance. In the open under-15s, Ben Pickford (aged 11) claimed silver behind Horwich RMI’s Matthew Flatters (5:38) around the one lap course, whilst Isabella Merritt (aged 9) was first girl (6:10) and fourth overall. The kitbag mementos and medals were well received, though the Haribo sweets appear to have won the day!